Several destinations come to mind when you talk about either a weekend trip or a short vacation from Delhi; or any other city nearby. Places like Shimla, Mussoorie and Rishikesh tend to become the preferred choice; but another place that not many people consider is the small town of Lansdowne. It is a highly scenic and much easier to reach hill station in the state of Uttarakhand that makes up for a perfect weekend getaway; or even for a longer trip with family and friends for a few days. For a brief introduction, located at a height of 1,700 meters, Lansdowne is a small hill-station in Pauri Garhwal region of Uttarakhand. The town is named such after Lord Lansdowne, the then Viceroy of India, who visited the place in 1884. It is in fact a cantonment and much thanks to Indian Army, remains to be a place that is not yet spoilt by tourist mania. It still retains its quiet and serenity, unlike the other popular hill stations of our country. The entire town is administered by the cantonment board and hence is much cleaner, less commercialized and well connected by super smooth roads. How you can plan your trip to Lansdowne is what I will be talking about in this article; providing some necessary details on how to reach, where to stay and what to see. Fun fact to know is that the real name of Lansdowne in old days was actually Kaludanda, literally meaning as Black Forest in Garhwali; “Kalu” meaning Black and “Danda” meaning Forest. It then changed to Lansdowne in 1887 and developed by the British for catering for the Recruits Training center of the Garhwal Rifles. Even till date, the famous Garhwal Rifles of the Indian Army has its command office here at Lansdowne. Let me begin by first writing about why you should plan on visiting Lansdowne. The biggest reason is that the place is not too hard to reach. Most of the journey in fact is through plains; and it is only the last 35 to 40 kilometers that involves driving in the hills. Roads are mostly all good except for a few bad patches in between. A drive to Lansdowne will not be too long and too tiring. Second reason is that it is very well connected which can be a great assurance to a lot of people. There are a lot of hotels here and phone reception is excellent. No matter which network you are on, you will have both calls and data connectivity. The entire region is very clean due to the Army presence here and well maintained. You won’t find it dirty anywhere here nor does it get too crowded either. Yes on weekends it tends to get filled with tourists but not in the manner of Shimla and Manali where it becomes annoying in fact. It is a quiet, less crowded, not over developed, a bit undiscovered and one of the most tranquil hill stations of India. 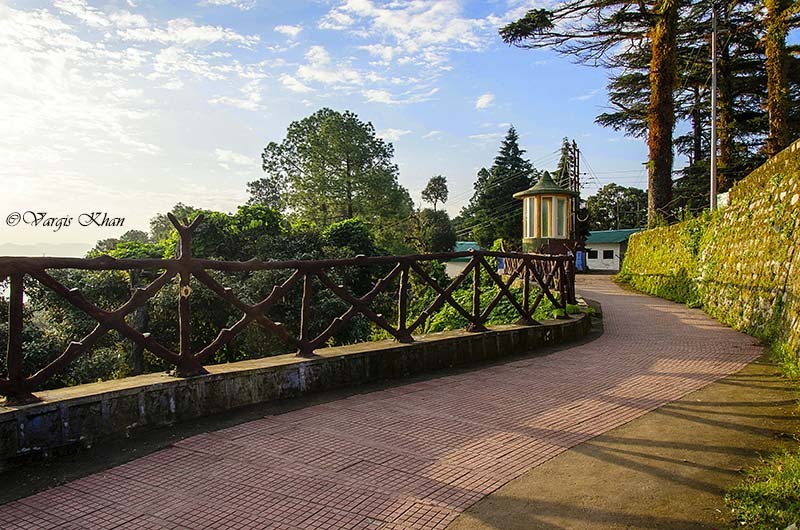 Away from the hustle-bustle associated with other tourist spots, the calm environment enriched with natural beauty of Lansdowne will enthrall you for sure. It still has several old buildings of British Colonial architecture and military history and its close proximity with Delhi NCR region makes it a perfect weekend getaway. I was recently asked this question by a friend who was planning to visit there with family. A straight answer to this question is that yes it is very safe to visit Lansdowne. It is a like a huge picnic spot that you can bring your folks to. There is Army presence all around and you got nothing to be afraid of. Yours will not be the only family here and there is also a huge police station right in the center of the town; hard to miss. There are hotels and restaurants all around where you will find many tourists from Delhi NCR having fun. Local people of Lansdowne are very humble and ensure welfare of the tourist folks. The crime rate in Lansdowne is almost negligible although common sense is always important to keep oneself out of trouble. Another thought that may come to mind is of rains; Is Lansdowne safe in monsoon? You will really have to keep a check on the weather in that regard but then considering the fact that the hilly drive is only about 35 – 40 kilometers in the end, I would say that Lansdowne is quite safe in Monsoon as well. Due to its location in Himalayas, the only way to reach Lansdowne of course is by road. You can either drive all the way from your home if you were living somewhere close. If not then you can reach the nearest rail station or airport and drive to Lansdowne from there. Further details are provided in the article below. For explaining this part, I will assume Delhi as the starting point. If you were driving to Lansdowne from Delhi, then the route of the journey will be as mentioned below. There can of course be multiple routes but I will explain the easiest and the best one. The entire journey by this route will be of about 250 kilometers, doable in 6 to 7 hours depending upon your speed and breaks. From Delhi till Khatauli, the road is awesome and a national highway via Meerut. At Khatauli, leave the highway and take the road towards Bijnor via Mirapur. From here, the road is -a two lane highway but mostly in good condition till Kotdwar. There are a few bad patches though as you get closer to Najibabad but you should still be able to make it to Kotdwar in about 6 hours from Delhi. After Kotdwar, you start climbing up and the entire 40 kilometers till Lansdowne is a steep climb. The good part however is that the traffic is very less and road is all smooth. There are several other ways that you can do this journey; but I will mention one route in particular so that you can actually avoid it. From Meerut, a lot of people enter the city and then take the road via Mawana, Jhunjhuni, Behsuma and Ramraj. They will then exit at Mirapur and take the road towards Bijnor but this entire stretch will eat up a lot of your time. You will first get stuck in traffic in Meerut; and then the progress will remain slow until Mirapur. A better way for the journey is to not enter Meerut, stay on the highway till Khatauli and then take the road towards Bijnor via Mirapur from there. I explained the route from Delhi but if you were coming from any other city, then the idea is to first reach Meerut or Khatauli. Then you can just follow the route I explained above via Mirapur, Bijnor, Najibabad and Kotdwar. If you were coming city like Chandigarh or Jaipur, then you can first arrive at Meerut and continue to Khatauli. If you were coming from Dehradun, Rishikesh or Haridwar side, then Khatauli will arrive first from where you can continue to Bijnor. If you were planning to travel by Bus then the idea is to reach Meerut or Kotdwar first. Government buses by Uttarakhand Transport Corporation (UTC) ply between Kotdwar to other cities like Delhi, Chandigarh, Dehradun and Meerut on a regular basis. If you were coming from Delhi, then there are several other private buses available as well for the journey. If you weren’t able to find a direct bus for Kotdwar, then look for one for Meerut. Buses for Bijnor, Najibabad and Kotdwar leave from Meerut almost every hour; both government run and private. Once you have reached Kotdwar, then reaching Lansdowne is going to be a child’s play. There are regular buses throughout the day between Lansdowne and Kotdwar which complete the journey in 90 minutes to 2 hours. These buses are both government run and private. Apart from buses, shared taxis too are a common sight on the route. These shared taxis are either a Sumo or Bolero and charge about Rs. 100 – Rs.150 per person for Lansdowne. You can find these shared cabs near Najibabad Chowk (in front of Hotel Ambey) in Kotdwar. Another option is of mini buses from Kotdwar station. These mini buses start from the bus stand right opposite the railway station and operate on a regular basis throughout the day. There is no direct bus from Meerut for Lansdowne; or at least not that I know of. From Meerut, you will first have to get to Kotdwar and look for a mode of commute there as I explained above. Lansdowne does not have a railway station of its own. The nearest railway station is at Kotdwar from where Lansdowne is at an approximate distance of about 40 kilometers that can be covered in about 90 minutes. Mussoorie Express and Gharwal Express are two trains that connect Delhi and Kotdwara. Doon Express is another long distance train in the region, covering cities like Kotdwara, Lucknow, Varanasi and Howrah. After Kotdwar, the next nearest railway station is at Meerut which is a major train stop. If you weren’t able to book a train directly to Kotdwar then finding one for Meerut is not going to be a problem at all. The nearest airport to Lansdowne is the Jolly Grant Airport, in Dehradun. It is 150 Kilometers away from the town. Once you land there, you will have to look for either a taxi directly to Lansdowne or Kotdwar. Or you can also board a bus for Kotdwar from Dehradun Bus stand. All the above mentioned modes of commute remain operational throughout the year. So even in peak winter season, you can reach Lansdowne using either of these. The only hitch can be of dense fog which happens a lot in this area in winter season. At times, the visibility can come down to zero which will slow your progress severely till Kotdwar. Extreme caution is advised while driving in such weather. If there was a snowfall in the town then the roads closer to Lansdowne can get blocked but only temporarily for a few hours. Army clears the road just as soon as they are able to. 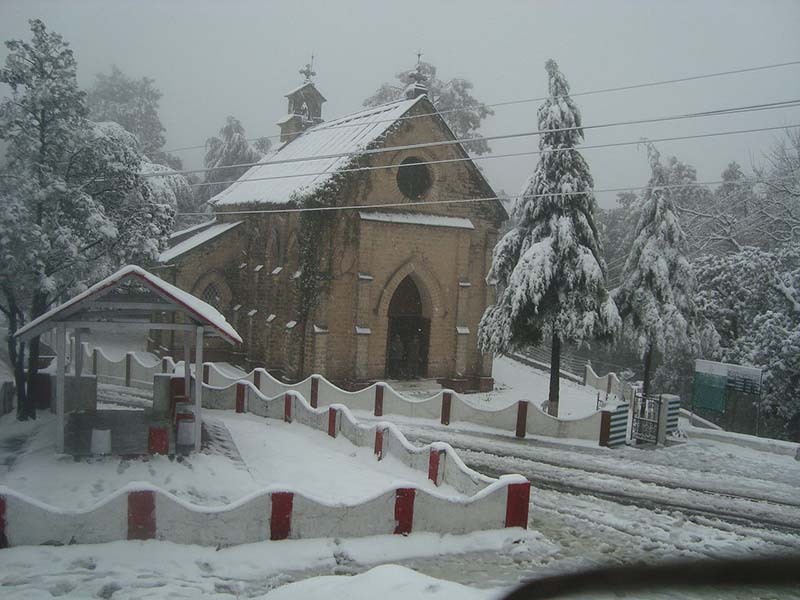 Due to its high altitude, the weather of Lansdowne remains pleasantly cold throughout the year. The months of January and February are probably the coldest with a small chance of snowfall. The months of March and April are among the best times when the weather is more enjoyable. Things start to get warm in April though and in May and June, you may even sometimes need to switch on the AC. Monsoon arrives in July and lasts till September during which time the entire region receives heavy amount of rain. It rains very less in September though which again makes it a good time to be here with all the lush green valleys around. October is the time of Autumn and best if you want to catch that golden color in the trees. November and December are again the months of winter when the weather again gets very cold. I have in fact provided an annual breakdown of how the weather trends in Lansdowne that you can read at A Month by Month Report of Weather in Lansdowne. This is another topic that I have covered in details in another article When is the Best time to Visit Lansdowne. But for a brief overview, best time to visit Lansdowne will really depend on what is it that you are looking for. Everyone’s reason for coming here is not always the same. Some people come here looking for snow and to catch their first snowfall; while a lot many others come seeking refuge from scorching summer. A Photography enthusiast will be looking forward to getting some great shots; whereas families mostly come looking to spend some quality time together. Whatever your reason is, Lansdowne is one place that is definitely not going to disappoint you. If snow is what you seek then January will be the best time to visit. Do note though that it does not snow in Lansdowne that often and that much. Spring season starts by late March and the months of March and April are great to bring your family around. If you are interested in photography then April, August and September will be best. For someone looking for green valleys all around, July, August and early September will do. If you want to get a bit orange in your shots then October will be best. If you are looking for some solitude and want to get away from the crowd, then Weekdays will be best. Hotels here tend to get all booked during Weekends; specially long weekends. What clothes you should pack for Lansdowne will entirely depend on the time of your arrival. For January and February, heavy woolens, gloves, woolen socks, muffler, thermals and a good quality heavy and windproof jacket is must. If you are visiting in March, some light woolens or a jacket will do. From April till August, just pack your regular cottons and that will suffice. In July and August, you may want to bring clothes that dry fast in case you got wet in rain somewhere. The months of September and October will much be like March needing some light woolens and a jacket. November and December will be the same as for January and February; requiring you to bring heavy woolens and a windproof warm jacket. Lansdowne itself is in fact a tourist attraction. This entire town is very scenic and the calm of the place is like no other. It is a popular weekend getaway but still manages to maintain its offbeat tag. It still does not get crowded like other popular hill stations. So if you were looking to visit a less crowded hill station, that does not involve too much driving but is extremely scenic then Lansdowne should be on your list. The natural beauty of the place is truly mesmerizing. With that being said, there are a few places that stand above the rest; spots that can be termed as tourist attractions. I have covered this topic in detail in another article and you can read it at What to See in Lansdowne. For a quick overview in this post below is a list of all places on tourist interest in Lansdowne. For more information on these places, please read Tourist Attractions in Lansdowne and its Vicinity. What to do in Lansdowne? The answer is ‘absolutely nothing’ but that is what you should be visiting here for anyways. There are no adventurous activities happening here; no huge markets and no long series of restaurants to eat at. Just a calm and peaceful little town tucked up in the hills where you can sit and relax for long hours. A trip here gives you ample of opportunity to break the monotony of life and spend some time with just yourself and your loved ones. Apart from the places I mentioned above, another nearby place that attracts plenty of tourists each year is Kalagarh Wildlife Sanctuary; which is actually a part of Corbett landscape and a heaven for wildlife and photography enthusiasts. It is not exactly near Lansdowne though and to get here, you will have to come down to Kotdwar and then go to Kalagarh. If you are into trekking then you can talk to any of the local tour operators and spend a couple of days trekking into the woods. Bird watching is another popular activity here but you may actually have to go to Kalagarh for that. The simplest activity however will be boating in Bhulla Lake. Lansdowne as I mentioned is a popular weekend getaway for Delhi NCR region; and even for people from other nearby cities like Meerut. Due to this, there are plenty of hotels here that you can stay at. However there are 2 things that you must keep in mind. The first one is that you must book in advance specially on weekends. It has happened with me; and a couple of other people I know; that we all arrived in Lansdowne on a weekend to find that there was not a single room available anywhere in the town. If you were coming on a weekday then you will easily find a room but you must book in advance if coming on a Saturday or Sunday. Second thing is that there are really no budget hotels here. The weekday / weekend logic applies here as well. If you came between Monday to Friday then you will be able to get a room for Rs. 1000 to R. 1500. If you arrived on Saturday or Sunday, then expect the prices to be around Rs. 2000 to Rs. 2500. If it was a long weekend and there was a tourist rush, expect the prices to be close to Rs. 3000 for very average hotels. Additionally, government-owned guesthouses (GMVN) are also present in Lansdowne. There is one near Tip n Top that I really liked but you will have to book these in advance. There are several banks in Lansdowne and they all have their ATM services as well. SBI, PNB, Bank of Baroda, Axis Banks are some of the major ones that I have noticed in Lansdowne. There are petrol pumps all across the route at regular intervals. There is a petrol pump in Lansdowne as well. There are mechanics available here as well but only for small fixes. For any major repairs, you will either have to bring your vehicle down to Kotdwar ; or take it to Meerut or Muzaffarnagar if Kotdwar too didn’t work. Medical assistance is available in Lansdowne. There are chemist shops, doctor’s clinics as well as a small hospital here. It being a cantonment, there is an Army Hospital available too that can be of help in case of a severe medical emergency. No matter which network you are on, your phones will be working fine in Lansdowne for both prepaid and postpaid connections. Data connectivity however can be a little slow. Starting from Delhi, the road is in excellent condition all the way till Khatauli. From Khatauli til Mirapur the road is a two lane highway but in good condition. From Mirapur till Kotdwar is a mix of good, bad and ugly. The final 40 kilometers stretch from Kotdwar to Lansdowne is super smooth. The local people here speak in Garhwali and Hindi languages; but quite a few can understand and speak in English as well. Lansdowne is a very small town that you can cover on foot in no more than a couple of hours. There is no internal transport system because it is not really required. There are however regular buses, shared taxis from the main bus stand to other nearby towns. Lansdowne is at an elevation of 1,700 meters (5,600 ft). There is nothing specific to buy in Lansdowne though. There are just a few grocery shops here selling day to day stuff, nothing more. This place really doesn’t have any specialty as such but you can look for some handicrafts items if that interests you. There is one Javed Leather Shop here (also known as Javed Boot Shop) that I have heard sells some quality leather items like handbags, wallets, belts boots etc. I haven’t bought anything from here myself though so can’t really vouch for it but I have heard the name. In short, your shopping in Lansdowne will just be some small handicraft items that you may want to buy as souvenirs. There are numerous hotels and restaurants in Lansdowne where you can find quite a comprehensive menu. From North Indian to South, to Chinese; you will find it all here. There is however no such special dish that is particular to Lansdowne; just the usual Indian food. Hotels here are a bit expensive and tend to overcharge. I will rather recommend that you step out, take a walk through the market and eat at any of the restaurants. A few tips that I will add to end the article. As you approach Lansdowne, the cantonment area will arrive first and people get confused a bit there. Just keep driving through the cantt and you will finally reach the main chowk which is actual Lansdowne. There will be a lot of movements, vehicles, hotels, restaurants there with a huge circle in between so you will know when you reach there. I will recommend staying at a hotel near the main chowk only. Mayur Hotel here comes recommended. Do not click photos of Army buildings. It is prohibited and you may get in trouble for this. Don’t forget to catch sunrise and sunset both from Tip n Top. If you were having trouble to find a spot to park your car, then go straight to the police station. Right in front of the police station is a huge empty ground that is used as a parking. You can leave your car parked there safely for no charge at all. Your itinerary will really depend on where you are coming from, how are you traveling and how many days you had in hand. But assuming that you cam from Delhi, you can reach Lansdowne easily in a day. Arrive and rest on Day 1. On Day 2, spend the day visiting the local places and then you can return home on Day 3. If you had a day more to the trip, then you can visit the temples that are located a bit far from main town (as explained in the list above). Does it snow in Lansdowne? Yes but not that much and not that often. Snowfall usually occurs in the months of January and February only but it is very rare. Yes, definitely. The places is highly scenic and perfect for a quick weekend getaway. You must plan a trip and spend at least one day in the town. It is a quiet, less crowded, not over-developed and relatively undiscovered hill station. Due to the presence of Garhwal Rifles of Indian army and the entire town being a cantonment, it is much cleaner as compared to other hill stations of our country. I hope the information I provided above on visiting Lansdowne was of help. If you have any other questions; or need any further details; please feel free to ask in the comments section below; or at our Community Forum; and I will be glad to answer.